The village itself is said to be a classical example of deliberate Norman planning with its single main street fronted by houses and their burgages situated directly behind them. These houses and plots of the middle ages form a coherent unit imposed on the landscape and set in a regular system of fields, which themselves show the narrow strips representing more recent enclosures from an extensive ‘open field’ agricultural system. Despite its name it is not certain that the Templars were responsible for creating this planned settlement. When the order of the Knights Templar was disbanded in 1312 most of their property was handed over to the Knights Hospitallers who we know had a Commandery in nearby Slebech. There is one record of a transfer of property from Templeton to Slebech. The house and carucate of land was granted rent free to a Sir Thomas de Hungerford on the condition he supplied a priest for the chapel or church. The other possibility is that it was created by the one of the Mortimers who held nearby Narberth. It may have been incorporated from an earlier farm or holding established by the Templars. 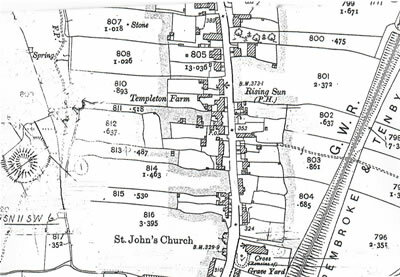 Captain John Poyer is believed to have been born at Grove, Molleston. His family had several tanneries in the area. He became one of the leading military figures in the civil war between the roundheads and royalists. He held Pembroke Castle against parliament after changing sides due to the poor treatment given to the loyal parlimentary supporters. He was eventually captured and shot at Covent Garden in London. The railway line came through Templeton shortly after the completion of the railway bridge that crosses Tanners Lane at the bottom of the village. The first train steamed slowly through the village in 1866 and linked the Pembroke and Tenby line. Templeton was opened for Goods in 1867 and shortly afterwards Templeton Brickworks was constructed by the side of the line. The bricks were then shipped all over the country by rail. 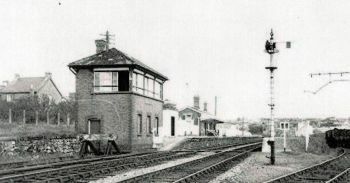 The station was opened for passengers in 1906 and provided an excellent service for the village for almost 60 years. Templeton Brickworks opened circa 1868 and was known as Templeton Silica Works. 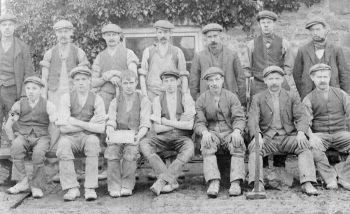 The bricks produced were a specialised fire brick invented by the Quaker Entrepreneur William Weston Young better known for his work as an illustrator of Swansea pottery and his involvement with Nantgarw and Swansea pottery. The rock used to make the bricks was sourced from 3 local Templeton quarries, Cleggars, North Hill and Whitehouse. They ceased making bricks in the 1920’s.